Urgent Notice on Further Improving Home-Stay Program. The employees at a hospital in Xinjiang that are sent to live with Uyghurs through the “home-stay” program are instructed to watch for “suspicious” activities in the families, such as not crying at funerals, quitting smoking, or growing a beard. The home-stay program involves various government officials and cadres living at Uyghur households to monitor and “educate” them. 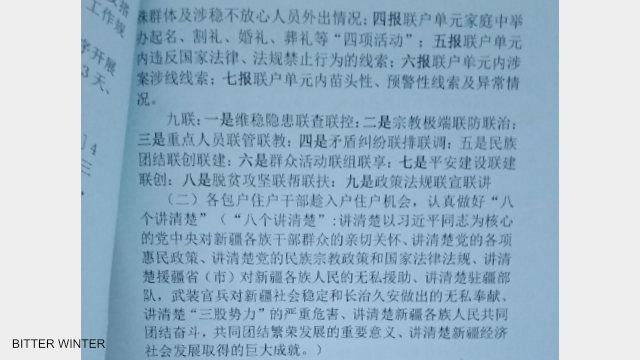 Bitter Winter has accessed a document issued by the management of a hospital in western province of Xinjiang that details the requirements for its staff sent to live with Uyghur families. As per the document, entitled Urgent Notice on Further Improving “Home-Stay” Program, the hospital employees are expected to focus on monitoring the families whose members have left China or whose whereabouts are unknown and “persons exhibiting strange behavior.” The staff is also supposed to determine, which family members those living outside the country contact most frequently. The document lists various behaviors that are suspicious and must be investigated. These include but are not limited to: quitting smoking or drinking alcohol, maintaining a beard, not singing at weddings or crying during funerals of relatives. Parents not allowing their children to attend school for no valid reason and persons who went on a pilgrimage outside China and exhibited changed behavior upon returning home should also be given special attention. Other groups of particular interest include younger people, born after the 80s that have access to computers and mobile phones, and those who participate in underground scripture readings, women who cover their face or wear hijab; those who talk about halal and haram. Further, the document lists seven different kinds of reports that a “home-stay” program official needs to file. Among them: changes in the number of family members; new leads and information that need further investigation; travel information of family members that are deemed problematic in terms of social stability; celebrations, such as circumcisions or weddings, and other events in the family, like funerals; “anti-regulatory” behavior, and others. The staff must also educate the members of their assigned households regarding the Party and its policies. 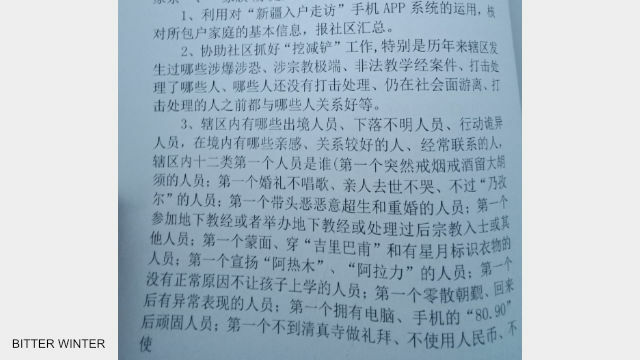 As per the documents, the hospital employees that participate in the program, must “clearly explain the selfless assistance provided by Xinjiang-aiding provinces to people of all ethnic groups in Xinjiang,” “the selfless dedication of troops, armed officers and soldiers stationed in Xinjiang towards Xinjiang’s social stability and lasting security,” and so on. Teaching the Chinese language is also among the tasks that must be performed as part of the home-stay program.